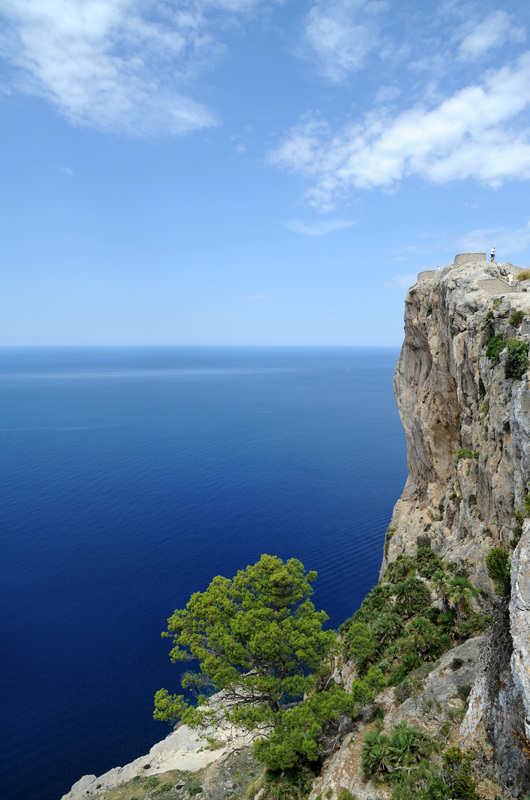 The peninsula of Formentor (Península de Formentor) is a strip of land long and narrow, 3 km wide at its narrowest part, and widens to 12 km in the middle, the peninsula ends with the Cap de Formentor, the northernmost point of the island of Majorca, where stands a lighthouse. 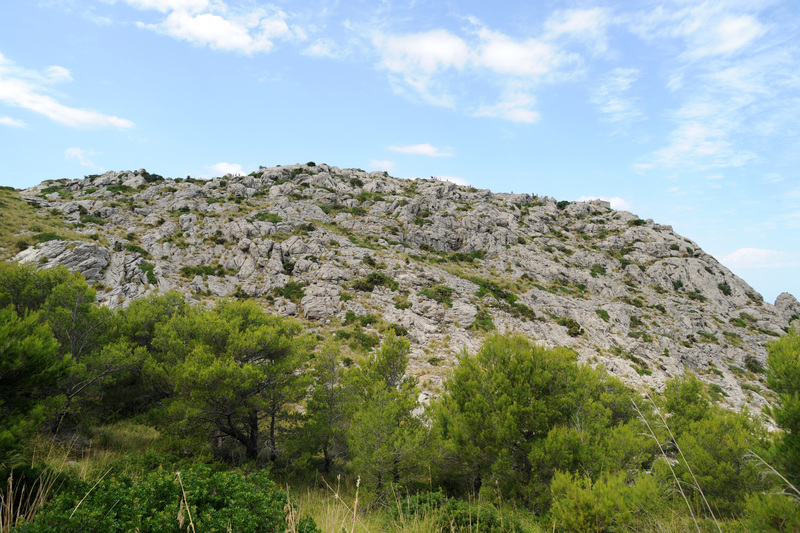 Its highest point is the Puig Fumat to 384 meters. 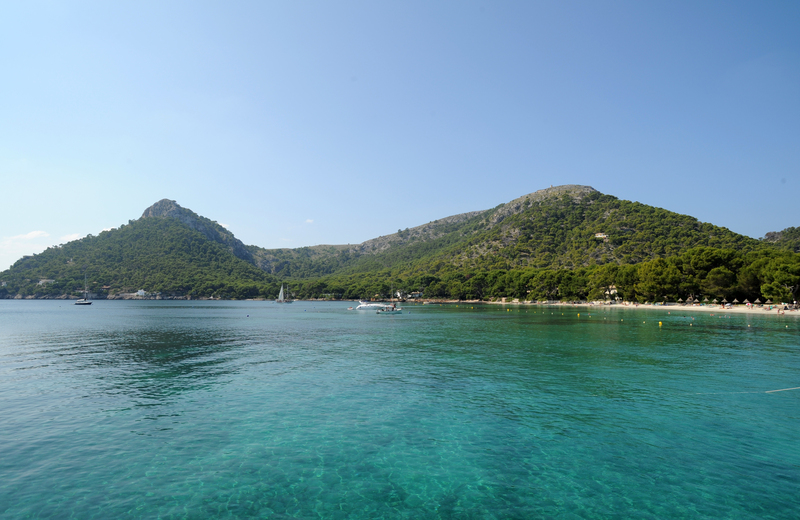 The peninsula has one of the largest and most attractive natural beaches of the island, the beach of Formentor, located on the east coast. 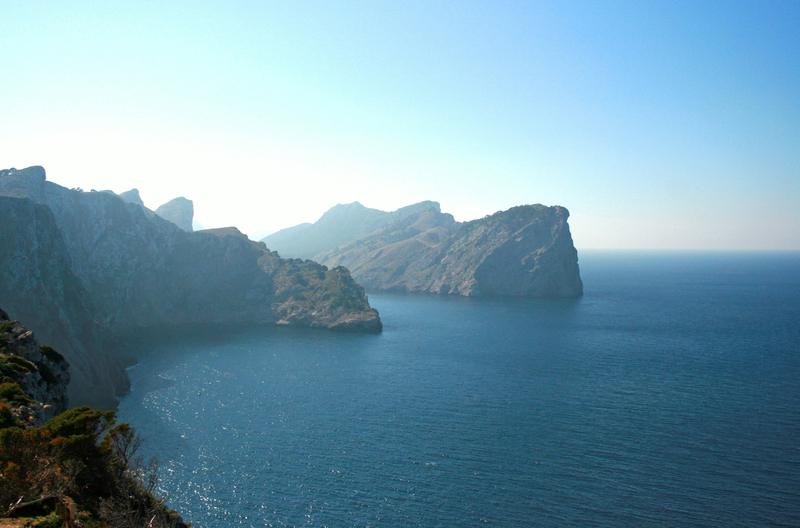 The coastline of the peninsula is dotted with coves, the most notable are: Cala Figuera, the Cala Murta and Cala Pi de la Posada. 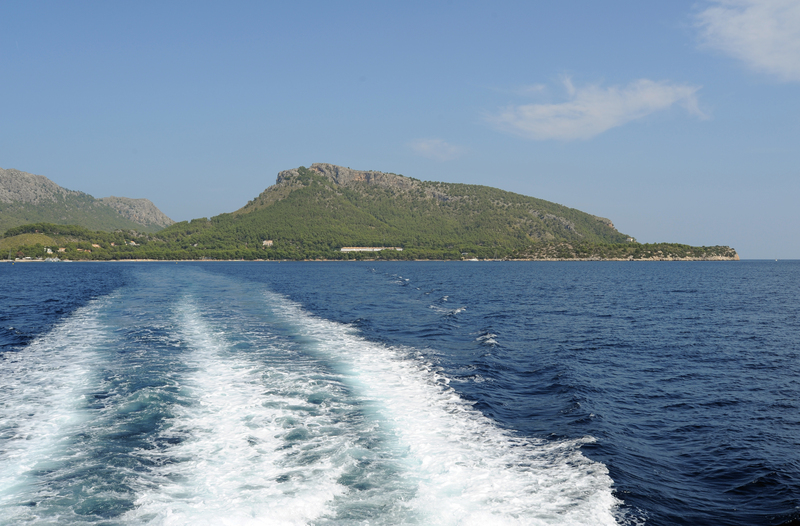 The name "Formentor" means "wheat", the breadmaking wheat, although the peninsula does not seem to lend itself to the cereal crops. The name of the island of Formentera - next to Ibiza - has the same origin. 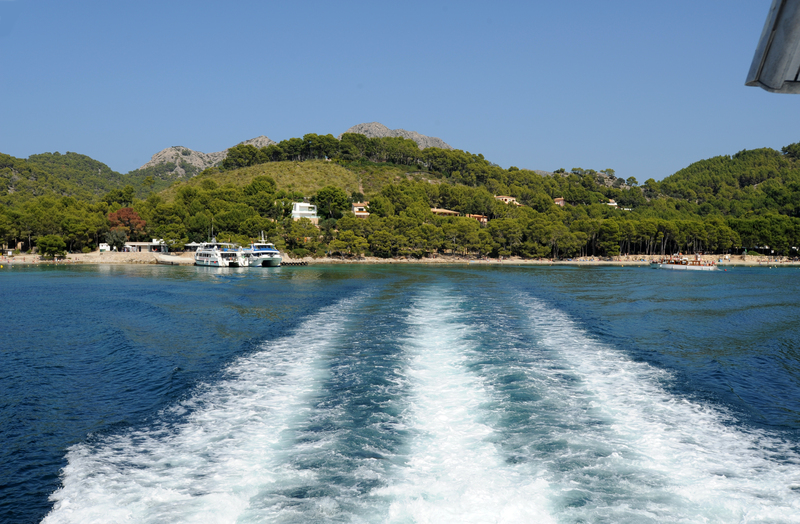 The peninsula of Formentor is located on the northern tip of the island of Majorca, in the north-east of the village of Port de Pollença, the peninsula is part of the municipality of Pollença. 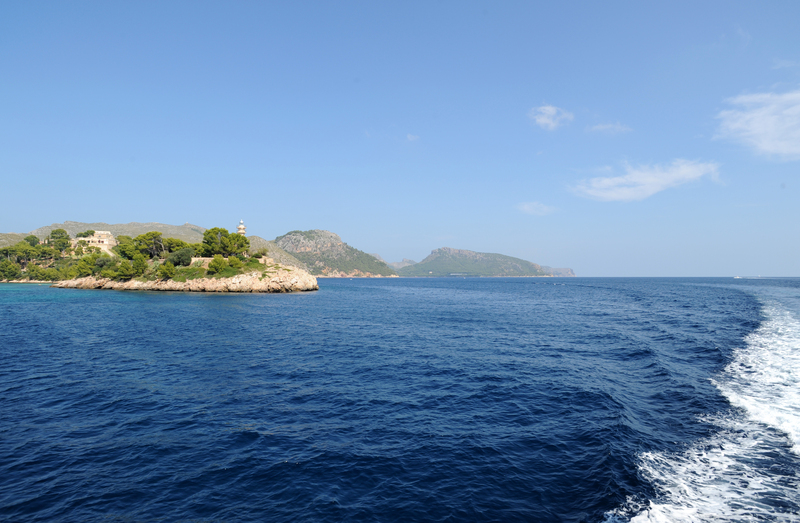 Its end, the Cape of Formentor, marks the northern limit of the Serra de Tramuntana. 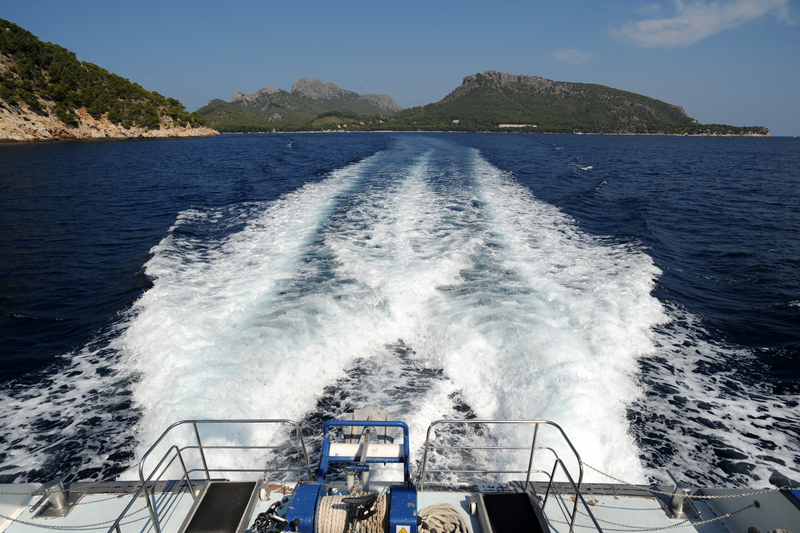 The Formentor peninsula is one of the most visited places of Majorca, for the beauty of its landscapes that combine the sea and the mountains. 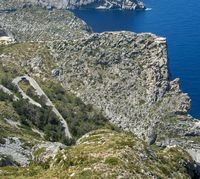 The road runs through the 2210 Ma-high ledge of the Formentor peninsula, from Port de Pollença road first reaches the lookout of the Dovecote, after a pass, the road crosses a 200 m tunnel under Mount Fumat and leads to the lighthouse of Cap de Formentor. 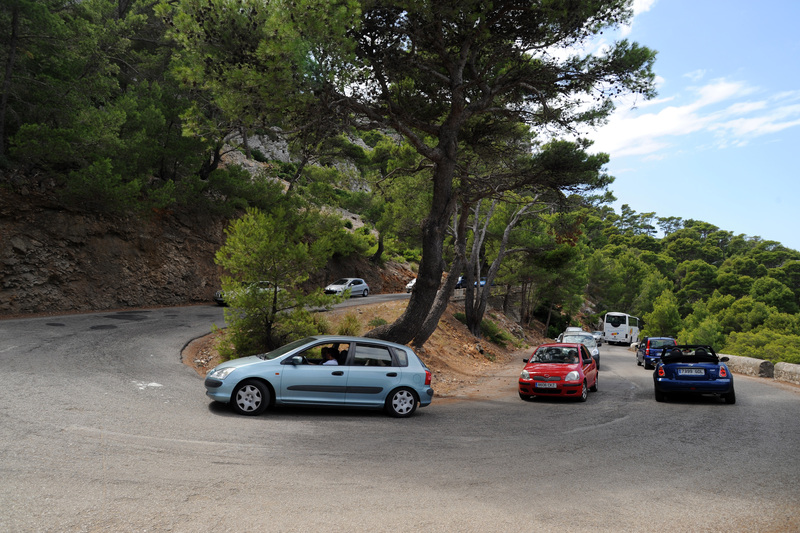 This winding road, sometimes dizzying, 19 km is the work of the Italian engineer Antonio Paretti (Antonio Parietti Coll) which can be seen the memorial near the parking lot gazebo to Es Colomer he also built. The engineer knew Paretti, at best, use the relief of the Serra d’Albercutx, drawing turns wherever the slope allowed, and digging the rocks that where the slope was too strong. The construction of the road was very difficult, sometimes the workers to be tied to trees to avoid falling into the sea from cliffs. 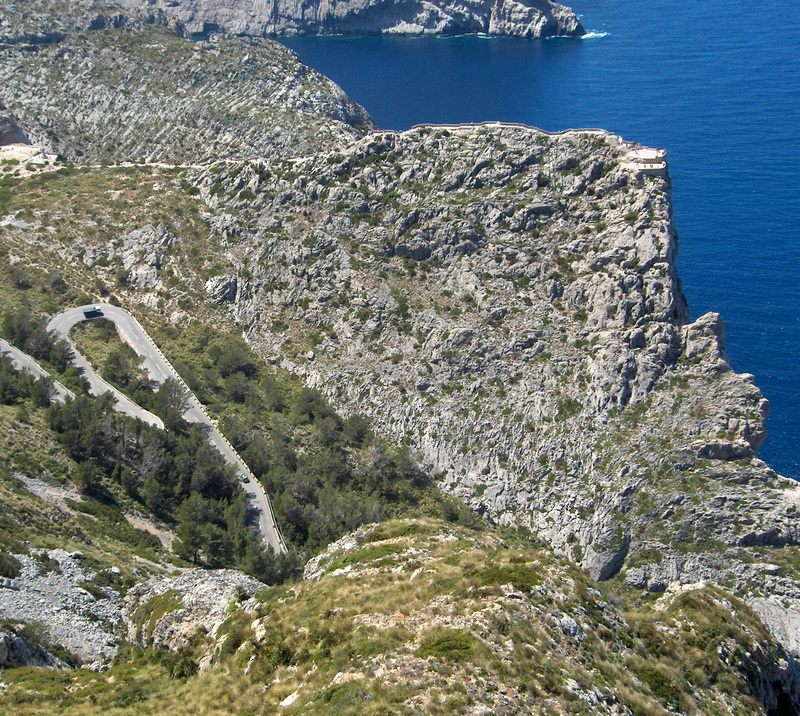 However masterpiece Paretti remains the serpentine road of Sa Calobra. 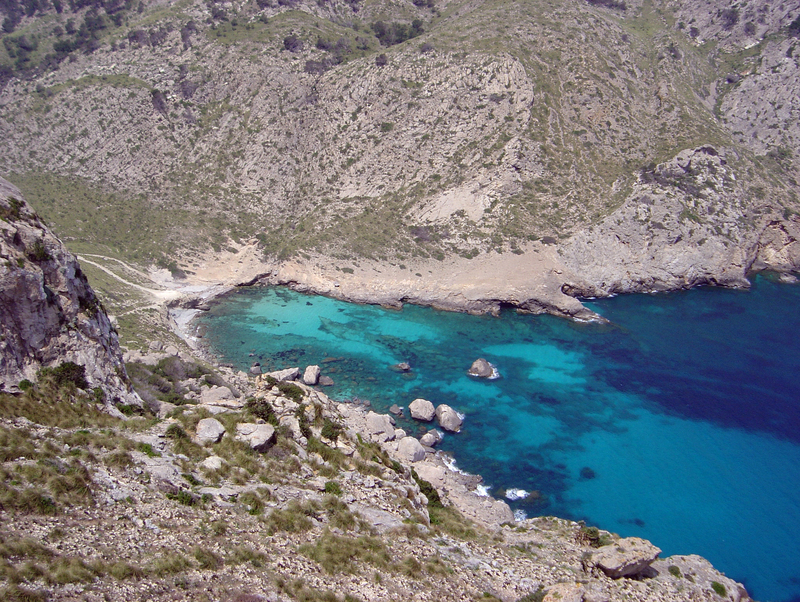 The first cove on the northwest coast of the peninsula is the cove of Cala Vall de Bóquer, which can be seen from the viewpoint of the Dovecote. 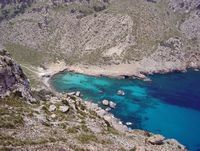 La Cala de Bóquer is a goal of hiking from the village of Port de Pollença and the trail from the Finca Boquer and passes near the ruins of the pre-Roman city of Bocchoris, one of the oldest settlements in the island. 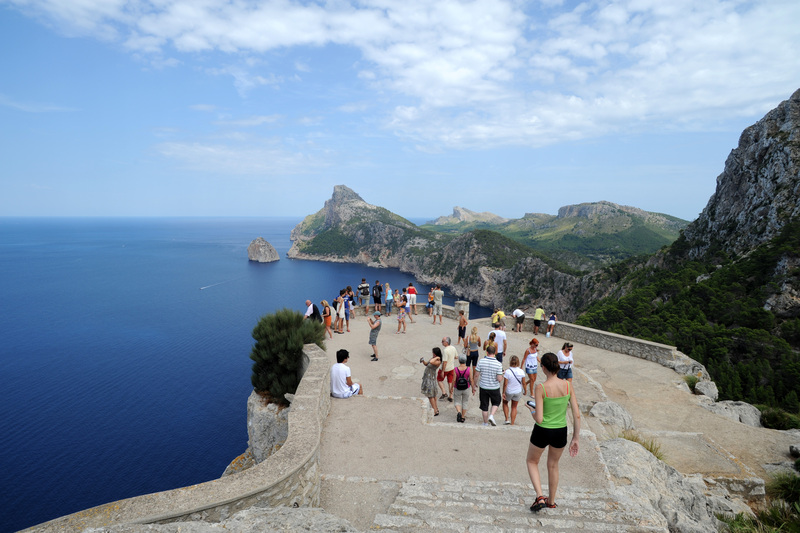 The Cape Formentor offers some spectacular viewpoints, the most famous is the viewpoint of the dove-cot (Mirador des Colomer), also known as the Mirador de sa Creueta, or the Mirador de Mal Pas, 4 km from the start of the road. 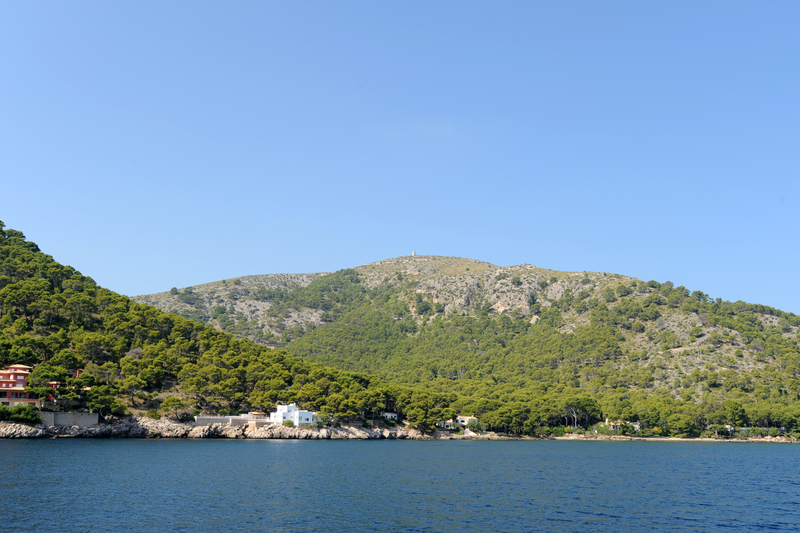 The Mirador of the Dove-cot sits on a promontory 200 meters high called the Ship Point (Punta de la Nau) at the end of the hill Mal Pas, it rises above the cove of Cala Boch. A path laid out broad staircases cut into the rock leads to this impressive overhang dominates the west coast of the peninsula, with, in the foreground, surrounded by a sea of indigo color, the island of Pigeon (Illot des Colomer), which owes its name to the pigeons that nest on cliffs. 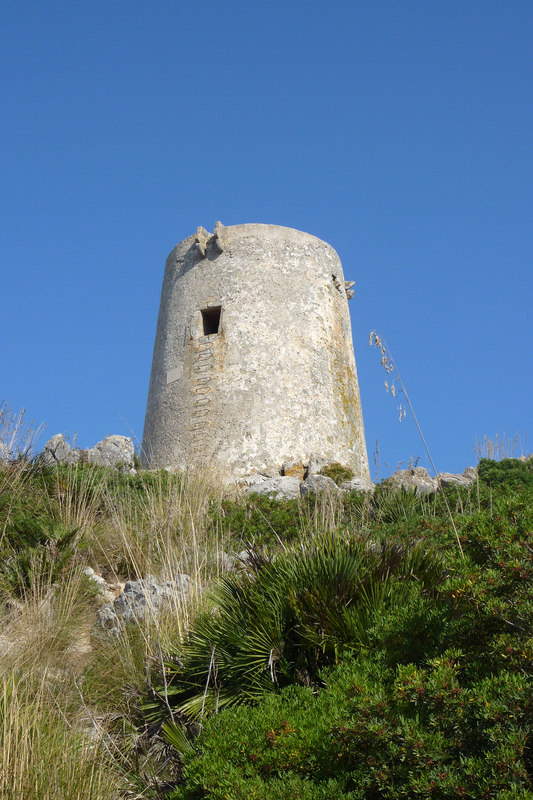 The Tower of Albercutx, or Albercuix still called Tower of Formentor is a watchtower built in the late sixteenth century was part of the defense system of Mallorca. 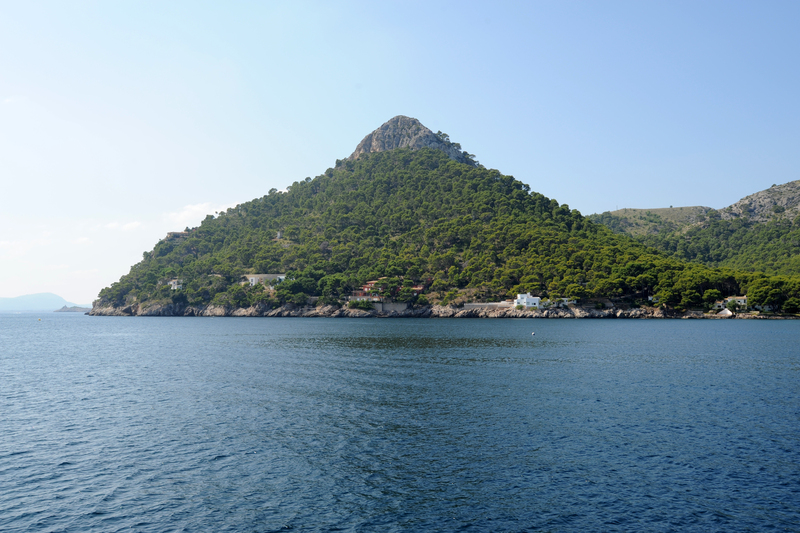 Erected at 390 m altitude, Talaia ("watchtower") watched the coast, visited frequently by Barbary pirates from pillaging villages. The Talaia Albercutx offers a breathtaking view almost circular. 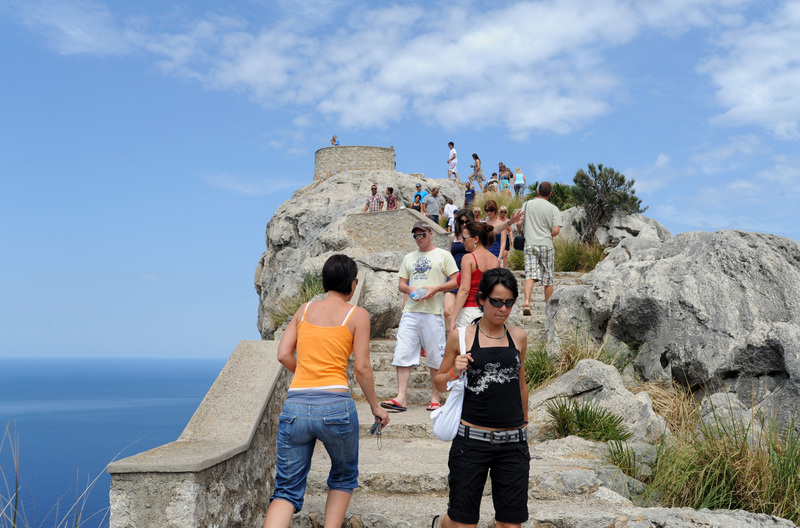 From the Mirador des Colomer, you can walk there in 20 minutes by a path of the Camí de la Talaia d’Albercutx, or by car via a small road that is to the right of the main road. 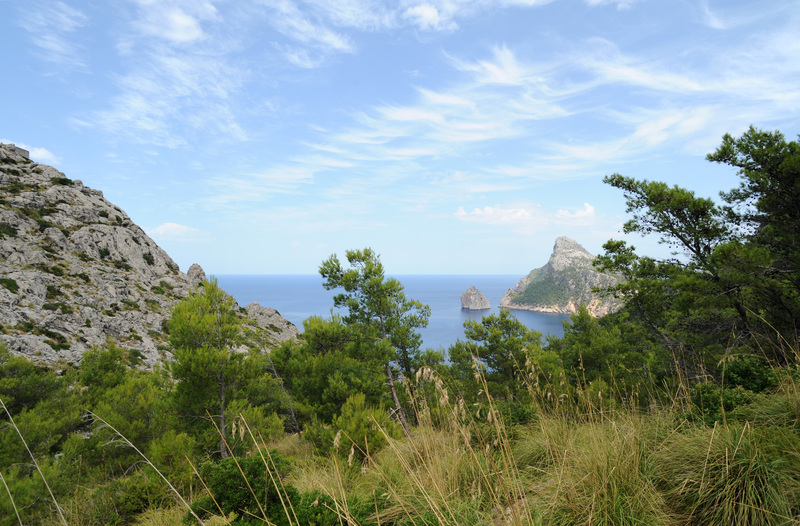 Point of the Advanced (Punta de l’Avançada) is a promontory located on the right side of the peninsula of Formentor, which ensures that the port of Pollença natural protection against the winds of the northeast. 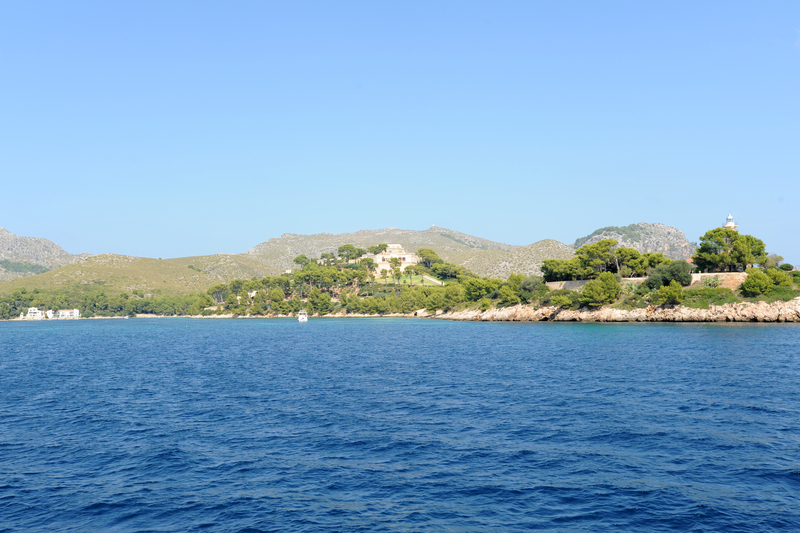 A fortress (Sa Fortalesa), with a military battery, was built in 1628 on the highest hill of the headland for the forward defense of the bay and the port of Pollença, the Fortalesa is now private property, considered private property the most expensive in Spain. Since 1898, a lighthouse marks the end of the tip. The Formentor beach is closed to the southwest by a steep hill, at the foot of the Albercutx on which to build a beautiful villa. Halfway road Ma-2210, a small road on the right leads to Cala Pi de la Posada, with a nice sandy beach, the Platja de Formentor. 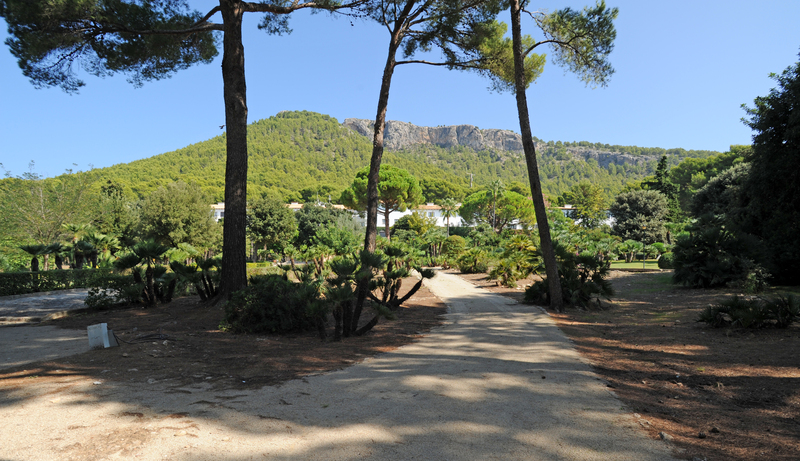 Creek Pi de la Posada sits at the foot of a legendary hotel, the luxury Hotel Formentor. Later - still on the right side of the main road - another small road leads to Cala Murta, another small sandy cove. 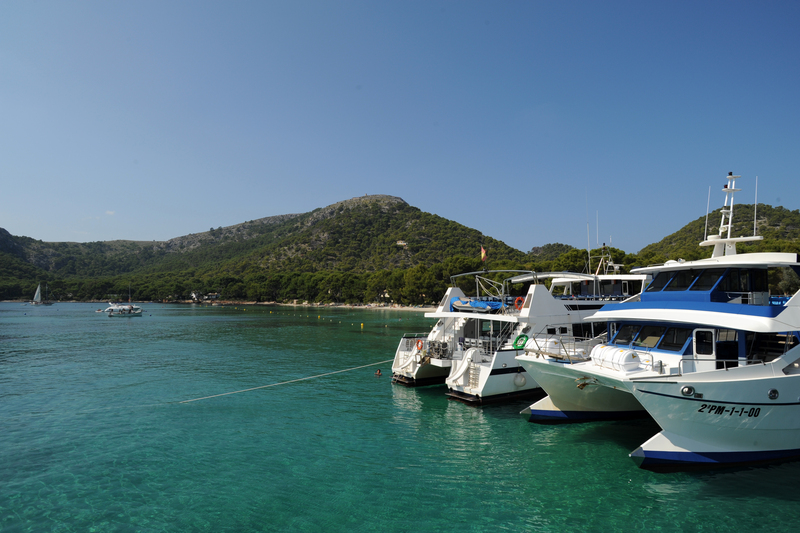 The next cove, Cala en Gossalba is only accessible by boat. 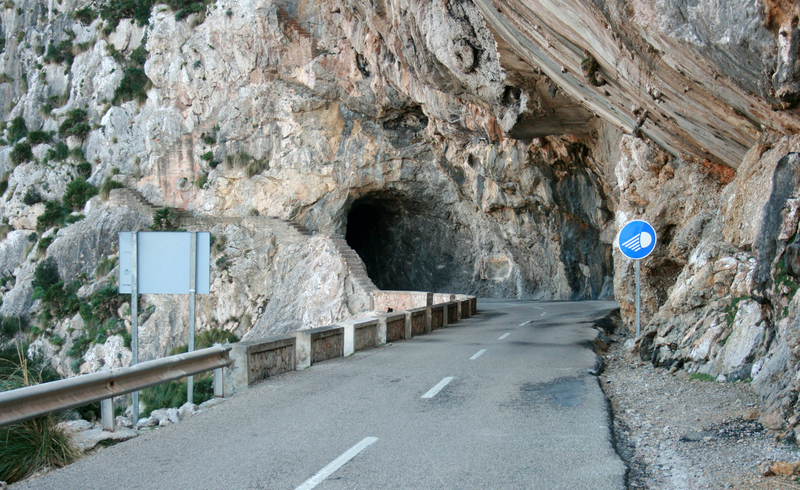 Beyond the bifurcation of the Hotel Formentor, the main road of the peninsula, the Ma-2210, along a woodland before reaching the tunnel under Mont Fumat peak: at the exit of the tunnel emerges from the dark mass of rock Cap de Formentor, a conical promontory sea cliffs and hills covered with scrub. 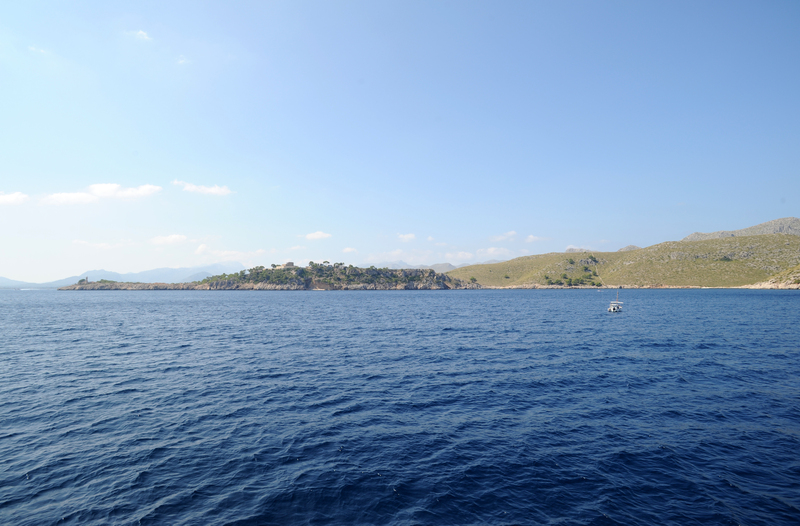 to the east, the coast of Menorca, 40 km apart, are visible to the naked eye on a clear day. 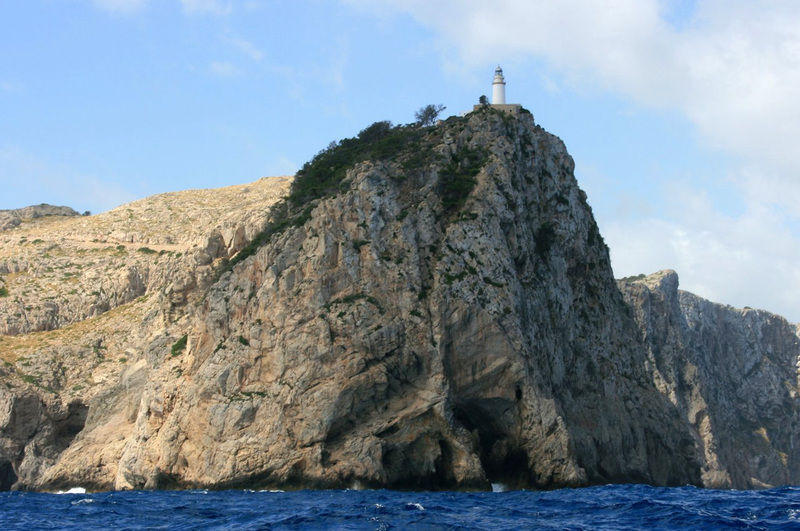 With Faro d’Artrutx which is the southwestern tip of Menorca, the lighthouse of Cape Formentor marks the narrowest point between the two islands of Mallorca and Menorca issue. The lighthouse, the silver dome, was built in 1863 it was then accessible only by sea can not approach the lighthouse, which can not be visited. The sparse vegetation of the Cape is an ideal habitat for lizards and small birds, especially bluebirds thrush (Monticola solitarius). Since the area around the lighthouse, you can see the steep cliffs facing east, home, from April to October, nesting colonies of Eleonora’s falcons (Falco eleonorae). During migration in the spring and summer, thousands of sea birds fly above the cap, especially Manx shearwaters (Puffinus puffinus) and shearwaters (Calonectris diomedea). The view from the cliffs is staggering to most intrepid, especially as the winds at the end of the course are furious and unpredictable. 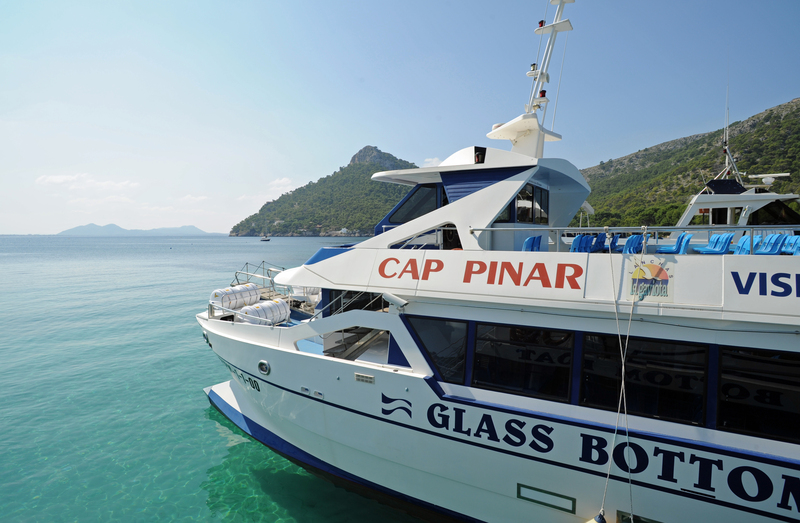 The Majorcan also called Cap de Formentor, the "appointment of winds". 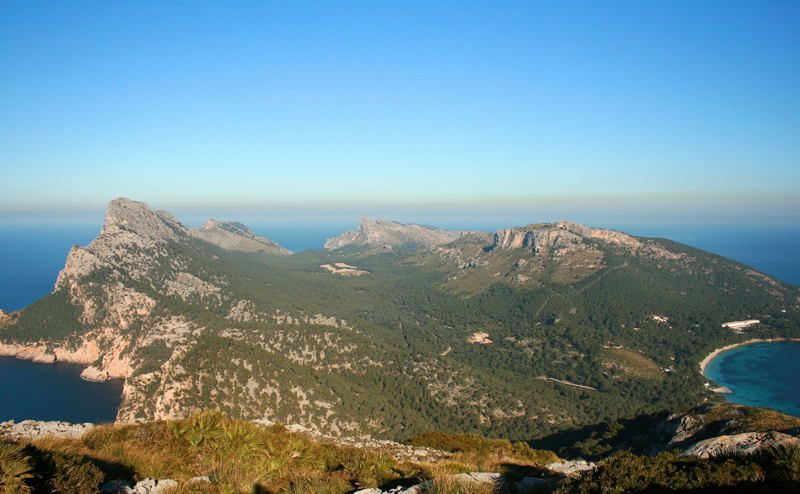 The winds that come together here are appointed by the Majorcan: Tramuntana (north wind), the Ponent (west wind), the Migjorn (south wind) and Llevant (east wind), nicknamed the "four big brothers" and "cousins": the Gregal (northeast wind), the Mestral (northwest wind), the Llebeig (southwest wind) and Xaloc (south wind East). 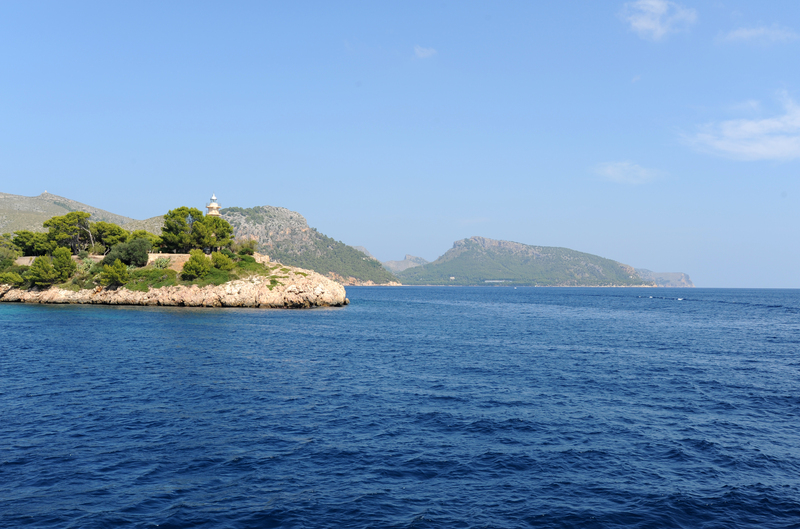 In 1875, the Majorcan poet Miquel Costa i Llobera (Pollença, 1854 - Palma, 1922) described the vicinity of Pollença and Formentor in one of the greatest poems in Catalan, "El Pi de Formentor" (The Pine of Formentor), in which he expressed the love of his country. "Mon cor estima un arbre! Més vell que l’olivera, més poderós que el roure, més verd que el taronger, conserva de ses fulles l’eterna primavera, i lluita amb les ventades que atupen la ribera, com un gegant guerrer. 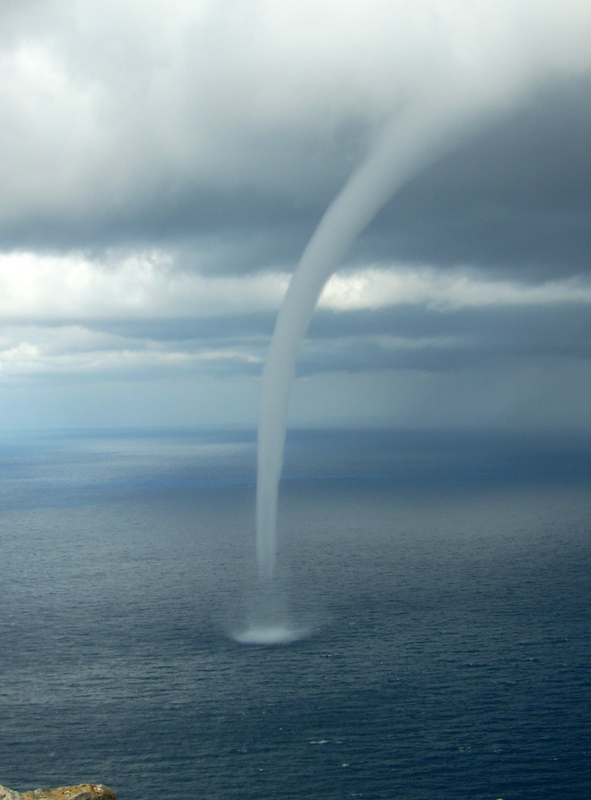 No guaita per ses fulles la flor enamorada; no va la fontanella ses ombres a besar; mes Déu ungi d’aroma sa testa consagrada i li donà per trone l’esquerpa serralada, per font l’immensa mar. Quan lluny, damunt les ones, renaix la llum divina, no canta per ses branques l’aucell que encativam; el crit sublim escolta de l’àguila marina, o del voltor qui passa sent l’ala gegantina remoure son fullam. Arbre, mon cor t’enveja. Sobre la terra impura, com a penyora santa duré jo el teu record. Lluitar constant i vèncer, reinar sobre l’altura i alimentar-se i viure de cel i de llum pura… oh vida! oh noble sort! Amunt, ànima forta! Traspassa la boirada i arrela dins l’altura com l’arbre dels penyals. Veuràs caure a les plantes la mar del món irada, i les cançons tranquiles ’niran per la ventada com l’au dels temporals."